Fair or unfair, German Web entrepreneurs get a bad rap for being copy cats. 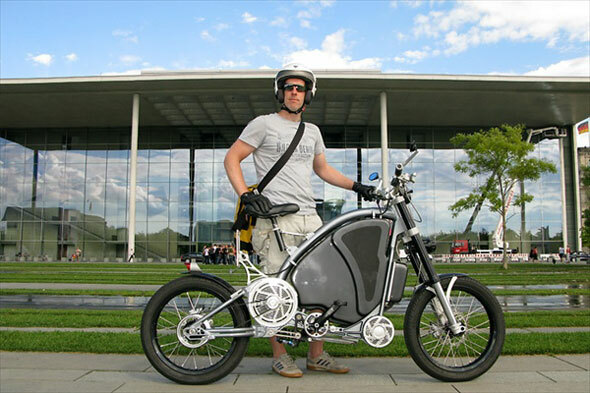 If Stefan Gulas is any representation, the same can’t be said for German entrepreneurs making…what I guess you would call futuristic motorized bicycles? Gulas has spent the last six years building something called the eROCKIT that defies a vehicle category. Unlike a motorcycle, it’s active– you have to pedal to make it go. But unlike a motorized bicycle it goes incredibly fast. So fast it can out accelerate a car. And it’s completely electric, borrowing some technology and looks from your home exercise bike. It reminds me of the Segway. You get on it and lean and suddenly you’re shooting across a room. We have one in the office and everyone who gets on it, can’t help but laugh. Similarly, you get on the eROCKIT and pedal, expecting the ingrained sense memory of a bike’s normal acceleration, when the thing just takes off, with a top speed of 50 miles per hour and a distance of 45 miles between charges. And the eROCKIT looks cooler than a Segway. (Not hard.) Gulas has a 3 inch thick binder of press clippings– which all started when a TV reporter was captivated watching him drive the thing around Berlin. Gulas thinks this odd power-pedaling will change the world of transportation and that all automobiles will become more active. I disagree. I lean more towards a future of multitasking in Google’s self-driving car than a return to the Flintstone’s car. But I could see the eROCKIT being huge in a city like San Francisco where it’s sunny almost every day and home to one of the most aggressive pro-bike cultures on the planet. Gulas wants to move the company headquarters to California if he’s able to close this funding round. He loves the German engineering heritage of the company, but says European investors have found the project too weird. In just a few weeks in the US, the difference in investor reception has been like night-and-day. While the knock in Europe was that he didn’t have a market for them to evaluate, he says investors here have said the lack of an existing, defined market is what interests them. And in a strange globalization twist, he expects making the bikes would be cheaper here because some of the materials come from the US, most notably the A123 electric batteries. Either way, he hopes to start selling them here in the next year. Some video of the eROCKIT in action below.